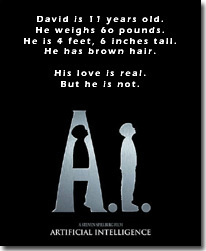 AI - Artificial Intelligence - Haley Joel Osment portrays a "mech" (robot) child who forms a unique, unbreakable obsession (love?) for his human "mommie." Steven Spielberg directed this emotional sci-fi story. Stanley Kubrick co-produced the film, but died before shooting started. Heard a rumor Kubrick was slated to direct; not sure that's true. Surely, it would have been a different story with Kubrick at the helm. Frances O'Connor plays Osment's "mommie." It's a terribly emotional role. Programming a machine to "love" a human is one thing. But will the human love the machine? What happens if the human can't? These are the questions posed in this film. I was quite stirred up by the end. Is love between a human and machine possible? Is hate? Are we prepared for such relationships? Most important question: What does it mean to be a "real" boy? A la Pinocchio, David (Osment's character) wants to be real boy. It leads to other questions: Can a machine ever be "real"? What does it take? Will machines always fall short? Is there a human soul that cannot be duplicated by a machine? Or are humans just a different kind of machine, no better than a mech? As good science-fiction should, this film poses such questions. Answers? No. Thought provoking stuff, though. I thoroughly enjoyed this film. Highly recommended.